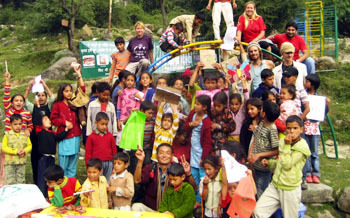 Our founder Jodie Underhill came to India in December 2008, travelled around India as a tourist and then volunteered at the Tibetan Children’s Village in Dharamsala. The garbage situation was something that bothered her every single day so in April 2009 she decided to do something about it. 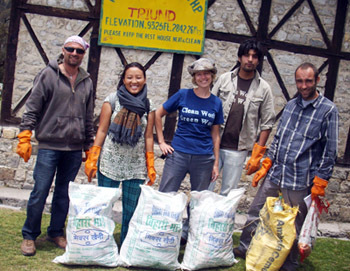 Jodie’s first mass clean up in McLeod Ganj, the home of HH the Dalai Lama was attended by over 100 people and it proved to her she wasn’t the only person who wanted a cleaner India. Soon after she formed the voluntary organisation Mountain Cleaners and started a weekly waste collection from Triund, a remote but garbage stricken mountain camp, a four hour hike from McLeod Ganj. 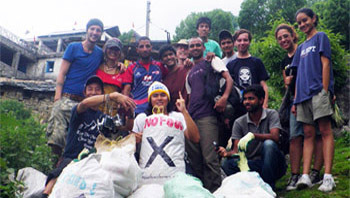 Volunteers were recruited to segregate and sort the waste from the chai shops and guest houses but also to clean the hiking trail and clear the backlog that had been thrown over the side of the mountain. 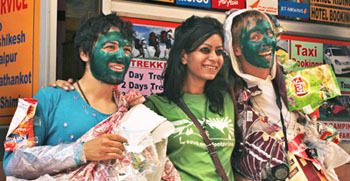 Triund is now known as one of the cleanest hiking destinations in India. In April 2011 the model was rolled out to the sacred Gaddi temple Guna Mata, a three hour hike from McLeod Ganj and in November that year extended to Bhagsunag Waterfall, a popular tourist hotspot. Ten dustbins for the local community were purchased and in April 2011 we recruited our first employee Lok Man to empty them. Over time more dustbins were installed meaning that people in the surrounding areas no longer needed to burn or dump their waste. Thanks to the ongoing support of volunteers they cleaned and started maintaining the children’s playgrounds, which until then had been used as dumpsites by the local hotels. To stop the waste being dumped there again Jodie set up a door-to-door waste collection service from businesses and households, taking on more staff to deal with the extra workload. Over 60 children attended the first educational Children’s Day held in October 2011 so we made a pledge to continue with them as monthly events. Tashi Pareek joined the team in December 2011 allowing us to expand even further. Jodie conducted beach clean-ups in Goa and helped to manage the waste at Sunburn music festival before moving to Dehradun in May 2012 to start her first urban project thanks to start-up funding from the Max India Foundation. With a dream of reaching out to all India, Waste Warriors was formed in September 2012 and the name says it all. We’re here to fight the war against filth and we want you to join us!